266 pages | 13 B/W Illus. 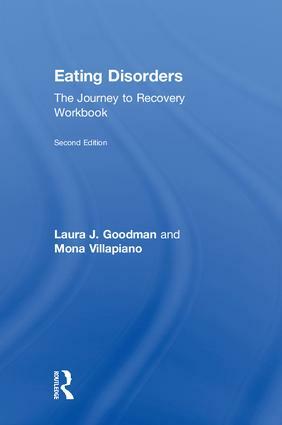 The widely updated second edition of Eating Disorders: Journey to Recovery Workbook helps those struggling with eating disorders in their recovery, guiding the reader through a greater consideration of body image, compulsive exercising, and personal and societal relationships based on Prochaska’s Stages of Change Theory. The workbook explores complicated issues having a direct effect on the eating disorder, including trauma, depression, gender identity, abuse, and the media. Updated to include the acknowledgement of binge-eating disorder, selective eating, and avoidant restrictive food intake disorder (ARFID), this second edition encourages self-paced learning and practice adjunct to one-on-one and group therapy from two seasoned clinicians in the treatment of eating disorders. Laura Goodman, LMHC has spent the past 25 years working as a licensed mental health counselor, specializing in the treatment of eating disorders. In addition to psychotherapy services, Ms. Goodman’s practice also includes consultation services, in-service trainings, and speaking engagements in the field of eating disorders and related fields. Mona Villapiano, PsyD, is a clinical psychologist specializing in the treatment of eating disorders. Over the past 35 years, Dr. Villapiano has treated hundreds of clients and their families while also developing and directing inpatient, partial hospital, and evening treatment programs. Recently retired from clinical work to move to San Francisco to care for her grandson, Dr. Villapiano continues to write and do research in the field of eating disorders.